Ralph and I decided late Saturday afternoon that we needed to run a few errands and that we’d like to get a late lunch/early dinner. One of our favorite places to go is the Gateway Diner in Westville. I love diners because they have so many choices for me. We often go to the Gateway for breakfast and lunches, but I had never had a dinner offering there. Our only problem with the experience is that we were seated in a booth next to 2 of the most obnoxious “fellow” diners ever. They were loud and talking about generally inappropriate things. It certainly put a damper on what was otherwise our usual good experience. That of course is not the responsibility of the restaurant, although I wish it was. 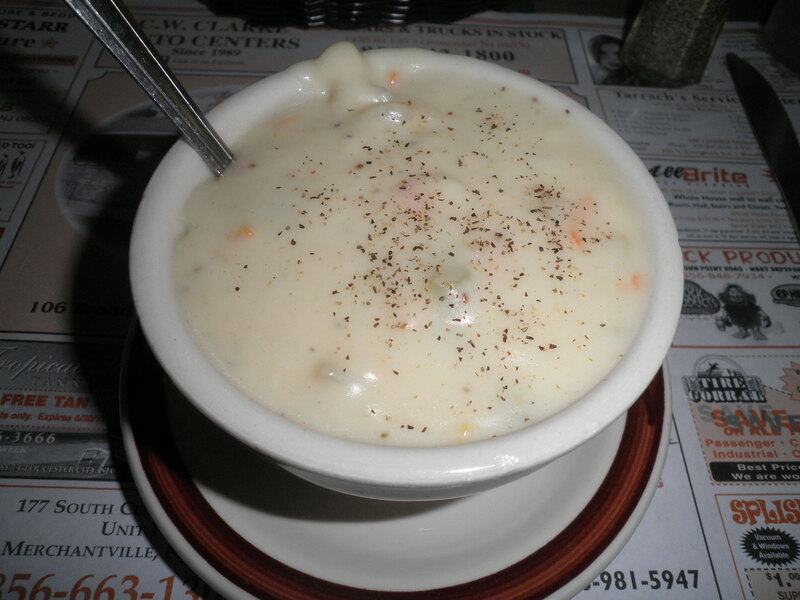 One of my favorite soups in the world is cream of celery, but you don’t see it often on restaurant menus. It was a little thicker than I would have liked, but it was delicious! 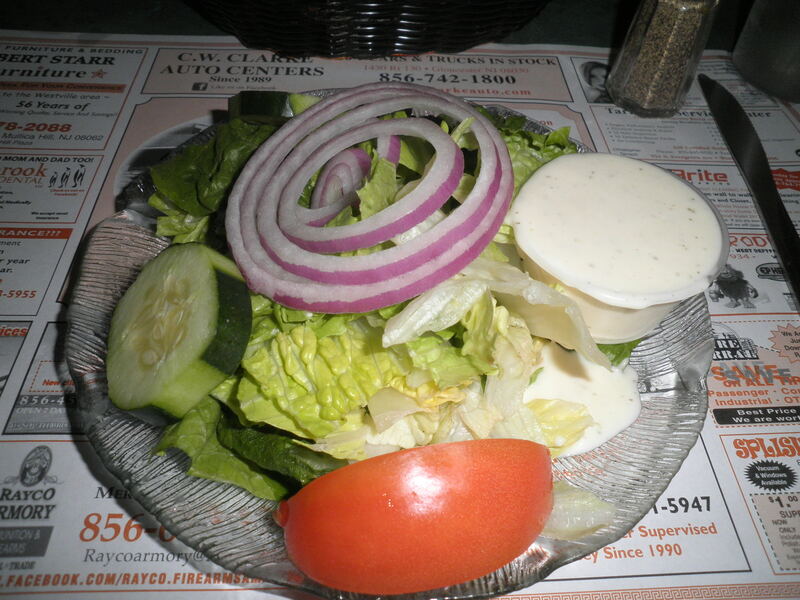 It came with a good salad and I got the ranch dressing on the side. I used my longstanding Weight Watchers trick of dipping my fork in the dressing first and getting just a tiny bit, then picking up the salad. It’s a great way to save on the amount of dressing you use. My dinner choice was eggplant parmesan. Some diners do this really well, some others not so good. This was a good experience. I got the pasta as my side dish and as usual I had to had the extra parmesan cheese and red pepper flakes. I was amazed at the amount of eggplant that I got. All this food for $6.19!! Incredible! Our waitress was very nice and accommodating. You could tell that she was frustrated by our noisy neighbors also. Overall it was a very enjoyable meal and I even have leftovers! Not sure what’s on the agenda today. I know I’m enjoying The Night Circus and there’s a new twist every few pages. My kind of book! That’s annoying about the people seated next to you – it’s so inconsiderate to other people. The eggplant dish looks delicious – it’s among my favourite vegetables. Hi Sarah, it was frustrating, but at least the food was good! Have a great week! You’re funny, Eleanor! I love it when I can save money eating out. Doesn’t always happen, but I try! 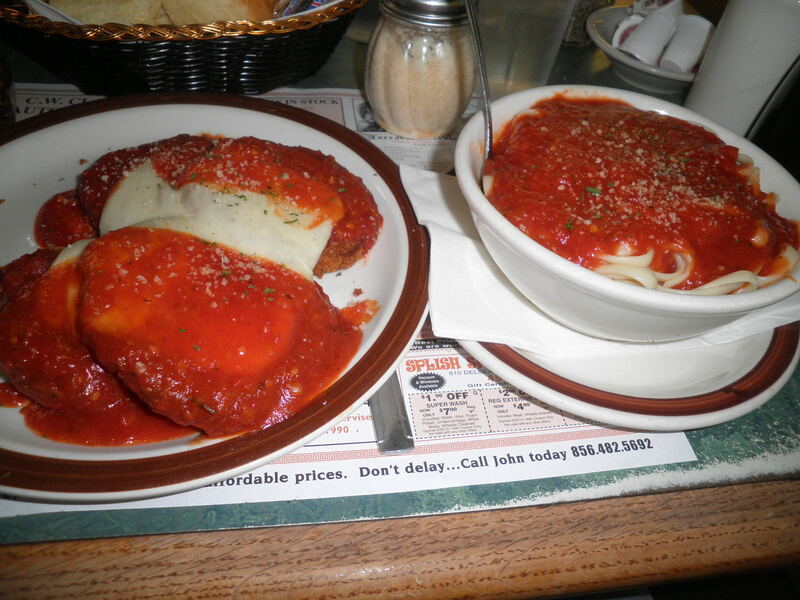 I wish restaurants would do a lighter version of eggplant parm. They don’t need to deep fry it the way they do. I should try my own version, you’re right. Let’s work on it! I’m back blogging!! I’ve missed reading your posts 🙂 Hope you are well! Erin! Welcome Back! I’ve missed reading your posts too! We’re doing well. We’re still not in New Mexico, but we’re working on it! Great to hear from you!